When a mother has placental insufficiency, there is a lack of adequate blood flow to the baby, which can cause the baby to have intrauterine growth restriction (IUGR), oligohydramnios, and nutrient and oxygen deprivation. When this occurs, the baby’s brain can suffer brain damage, hypoxic-ischemic encephalopathy (HIE), cerebral palsy, and seizures. Blood is brought to (and returned from) the unborn baby through the placenta. The placenta allows for nutrients to be transported to the baby, and it is also where gas exchange takes place. Oxygen-rich blood from the mother must travel through the placenta and umbilical cord in order to get to the baby. Placental insufficiency is the most frequent cause of intrauterine growth restriction (IUGR), a condition in which the unborn baby is failing to grow at a normal pace. It can also cause oligohydramnios (low amniotic fluid) and preeclampsia (high maternal blood pressure). What Does IUGR Look Like? The clinical course of placental insufficiency often includes an initial finding that the baby is small and has IUGR. Next, the mother is usually diagnosed with oligohydramnios. On a prenatal test called a Doppler study, there may be a decreased flow in the baby’s heart, which can progress to absent flow and then reverse flow, which can be quite serious. The baby may have fetal distress, which will show up on the fetal heart rate monitor as non-reassuring heart tones. The baby’s heart rate may become very fast (tachycardic) as she tries to increase her cardiac output. The baby’s heart tracings get worse (increasingly non-reassuring) as her reserves are lost. Placental insufficiency can cause severe injury to the baby. As blood flow (perfusion) becomes more and more deficient and the baby becomes increasingly oxygen deprived – or poor perfusion and oxygen deprivation continue for an extended period – the baby develops a high likelihood of having acidemia at birth. This means her blood is acidic due to prolonged anaerobic metabolism. Anaerobic metabolism occurs when there is insufficient oxygen to meet the baby’s energy needs. Due to the severe consequences of placental insufficiency, it is critical for physicians to promptly diagnose and adequately manage this condition. Mothers with placental insufficiency should be referred to maternal-fetal specialists. Very close monitoring, including frequent non-stress tests and biophysical profiles, should be performed. Sometimes the physician will decide to deliver the baby early by C-section delivery in order to get the baby out of the oxygen-depriving conditions. In addition, babies who have IUGR do not tolerate labor and contractions very well. This is another reason the baby may be delivered early. If babies who have IUGR are subjected to labor, they must be closely monitored and they should be emergently delivered at the first sign of distress. Uteroplacental perfusion refers to blood flow from the uterus and placenta to the developing baby. If uteroplacental blood flow is normal, the baby gets enough oxygen and nutrients. If uteroplacental perfusion is compromised, the baby may not grow properly or receive adequate oxygen and nutrients. During routine prenatal screening, medical professionals often use color Doppler to detect any abnormalities in uteroplacental perfusion, allowing them to diagnose and treat the underlying cause of any perfusion issues, which can range from maternal hypertension (high blood pressure) to structural uterine abnormalities to issues with the umbilical cord. They may also use non-stress tests (NSTs) or biophysical profiles (BPPs). Timely delivery when perfusion is compromised is critical. Placental resistance (resistance in uteroplacental blood flow) is a measure of how well blood is perfusing (flowing through) the placenta and uterus to get to the baby. This is checked during routine prenatal testing using Doppler flow studies. One of the most common concerns with placental resistance is high resistance, which can result from preeclampsia and other factors. When blood pressure increases, resistance increases, which can mean that overall blood flow to the baby decreases. This can cause fetal growth restriction (FGR). Insufficient placental perfusion is called placental insufficiency and must be promptly addressed by medical professionals. How is Placental Insufficiency Diagnosed? A mother with placental insufficiency usually does not have any symptoms. A diagnosis of placental insufficiency can be made if, during pregnancy, the baby has an abnormal heart tracing called “late decelerations” on the fetal heart rate monitor. Late decelerations are an indication of placental insufficiency, even when there are no other signs of reduced blood flow to the placenta. Another way to diagnose placental insufficiency is through measurements and ultrasounds that indicate that the uterus (womb) is not growing as it should. A mother’s uterus should be measured at every prenatal visit, starting about halfway through the pregnancy. If the measurements are less than what is normal for the gestational age of the baby, an ultrasound should be performed. The ultrasound helps the physician measure the baby’s growth and size, assess the size and placement of the placenta, and indicate if the amniotic fluid is low. Doppler ultrasounds give information about the blood flow in the placenta and baby. Doppler velocimetry can be performed at the beginning of the third trimester. This test measures blood flow in the mother and baby’s blood vessels and gives physicians information about uteroplacental blood flow and the baby’s responses to physiological challenges. When vessels in the placenta are developing abnormally, there are progressive changes in placental blood flow, as well as in fetal blood flow, blood pressure, and heart rate. This causes circulation problems in the placenta and baby. Doppler measurements from certain vessels, such as the umbilical artery, can indicate severe compromise and dysfunction of the group of vessels in the placenta. When compromise to these vessels is present, the baby may become significantly oxygen-deprived, and eventually, certain vessels will constrict and others will dilate to direct blood flow to the most important organs in the baby, the brain and heart. After this occurs, circulation through the umbilical artery may change even more in response to ongoing severe oxygen-deprivation. Blood flow measurements that the Doppler picks up correlate with acidosis in the baby. How Do Placental Insufficiency and IUGR Affect the Baby? Since placental insufficiency can cause the baby to be deprived of adequate oxygen and nutrients while in the womb, which can cause IUGR, the standard of care is to deliver the baby at 34 – 37 weeks. When the gestational age is less than 34 weeks, the physician will continue monitoring the mother very closely until 34 weeks or beyond. The baby’s well-being and the amount of amniotic fluid will be assessed regularly. If either of these becomes a concern, then immediate delivery should occur. When delivery is suggested prior to 34 weeks, the physician should perform an amniocentesis to help evaluate fetal lung maturity. If the decision is made to deliver the baby prior to 34 weeks, corticosteroids are usually given to the mother within 24 hours of the time the baby will be delivered. This helps the baby’s lungs mature, which can help prevent respiratory distress. Corticosteroids also help prevent brain bleeds in the baby. Failure to follow standards of care and deliver the baby early can cause her to be deprived of oxygen and nutrients for too long, which can result in permanent brain injury. Hypoxic-ischemic encephalopathy (HIE). HIE is a brain injury caused by insufficient oxygen in the baby’s brain. This can be caused by a lack of oxygen in the baby’s blood and/or a decreased flow of blood to the baby’s brain. HIE often leads to a later diagnosis of cerebral palsy, seizure disorders, or developmental disabilities. Cerebral palsy. Cerebral palsy is a group of disorders that cause the child to have problems with movement, balance, coordination, and posture. Specifically, cerebral palsy causes problems in brain to nerve to muscle communication, which causes mild to severe problems with motor (muscle) function. Children with cerebral palsy may have all limbs affected, or they may only have one or two limbs that don’t function properly. Fine motor function is also usually affected, which can make it hard for a child to hold a crayon or a small piece of cereal. There may be problems with oral-facial muscles, thereby making eating and talking difficult for children. Seizures. When a baby has brain damage such as HIE, she may have seizures very soon after birth. In fact, HIE is the most common cause of seizures in a baby. Seizures are not only caused by brain damage, but they can cause even more injury to a baby’s brain. For this reason, it is critical that physicians recognized and treat seizures as soon as possible. Seizures occur when there is uncontrolled electrical activity in the brain. This causes brain disturbances, altered consciousness, and convulsions. In many babies, outward signs of seizure activity may not be evident. Thus, if the medical team thinks that a baby may have brain damage, they should perform frequent EEGs on her to check for abnormal electrical activity in the brain. Several neonatal intensive care units throughout the country have continuous EEG monitoring. Hypoglycemia. Babies with IUGR are at risk of having low blood sugar. This is because the baby has decreased stores of glycogen and lipids. Neonatal hypoglycemia is very serious because it means that the baby’s blood sugar (glucose) level is lower than normal. Glucose is essential for brain function. If hypoglycemia isn’t promptly recognized and treated, the baby can suffer permanent brain damage and cerebral palsy. Meconium aspiration can also occur when the mother has placental insufficiency. Meconium aspiration is when a baby has a bowel movement in the womb (which typically occurs when the baby experiences oxygen deprivation and distress) and then inhales a mixture of stool and amniotic fluid. This can cause major breathing problems after birth. A baby who inhales meconium may have respiratory distress and may develop pneumonia. These conditions can cause even more oxygen deprivation in the baby, which increases the risk of brain damage and HIE. In addition, babies who have meconium aspiration syndrome often have to be placed on a breathing machine (ventilator) for help breathing. This increases the babies’ chances of having overventilation injuries, which can cause brain damage and cerebral palsy. Due to the potential oxygen (and nutrient) deprivation in babies of mothers who have placental insufficiency, the standard of care requires more frequent prenatal testing and that physicians pay very close attention to signs of IUGR and decreased well-being of the baby. Failure to take appropriate action when a baby has IUGR and is receiving decreased blood flow can cause the baby to have brain damage and hypoxic-ischemic encephalopathy (HIE), cerebral palsy and seizures. The award-winning lawyers at Reiter & Walsh ABC Law Centers have been helping children with HIE and cerebral palsy throughout the nation for almost 3 decades. Jesse Reiter, the firm’s co-founder, has been focusing on birth injury cases his entire career. Jesse and his team help children all over the country, and when they take a case, they spend a lot of time getting to know the child and family they are helping so they can fully understand the child’s needs. 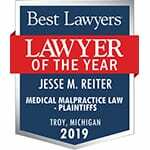 Jesse has won many awards for his advocacy of children, and he is currently recognized as being one of the best medical malpractice lawyers in America by U.S. News and World Report 2015, as well as one of the 10 Best Attorneys in Michigan by Super Lawyers magazine. Reiter & Walsh ABC Law Centers is also recognized as being one of the best medical malpractice law firms in the country by U.S. News and World Report 2015. Birth injury law is a difficult area of law to pursue due to the complex nature of the medical records. The lawyers at Reiter & Walsh have decades of experience with birth injury, hypoxic-ischemic encephalopathy, and cerebral palsy cases. To find out if you have a case, contact our firm to speak with an experienced attorney. We have numerous multi-million dollar verdicts and settlements that attest to our success, and no fees are ever paid to our firm until we win your case. Email or call us at 888-419-2229. Our attorneys are available 24/7 to speak with you. Selling KE, Carstensen J, Finnström O, Sydsjö G. Intergenerational effects of preterm birth and reduced intrauterine growth: a population-based study of Swedish mother-offspring pairs. BJOG 2006; 113:430. Neerhof MG. Causes of intrauterine growth restriction. Clin Perinatol 1995; 22:375. Lin CC, Santolaya-Forgas J. Current concepts of fetal growth restriction: part I. Causes, classification, and pathophysiology. Obstet Gynecol 1998; 92:1044.
von Dadelszen P, Ornstein MP, Bull SB, et al. Fall in mean arterial pressure and fetal growth restriction in pregnancy hypertension: a meta-analysis. Lancet 2000; 355:87. Burton GJ, Hempstock J, Jauniaux E. Nutrition of the human fetus during the first trimester–a review. Placenta 2001; 22 Suppl A:S70. Caniggia I, Winter J, Lye SJ, Post M. Oxygen and placental development during the first trimester: implications for the pathophysiology of pre-eclampsia. Placenta 2000; 21 Suppl A:S25. Jansson T, Powell TL. Placental nutrient transfer and fetal growth. Nutrition 2000; 16:500.